Yesterday was Labor Day and my husband had the day off and he came up with the most wonderful idea to have a picnic in the park AND to visit a new park that was close by to us. Fraser is relatively close and he discovered a park called Fort Fraser there. We ended up dodging some thunderstorms that seemed as though they were heading our way. We heard lots of thunder in the distance. We really lucked out! We stopped off at Firehouse Subs in Roseville, MI to get our food for the picnic and we brought along a cooler to keep it cold on the way there. Unfortunately, they do not offer any gluten-free options for bread so I had to go with a salad. The salad ended up being a great choice though and I am actually so glad I got that. It was so delicious that I did not even miss the bread! 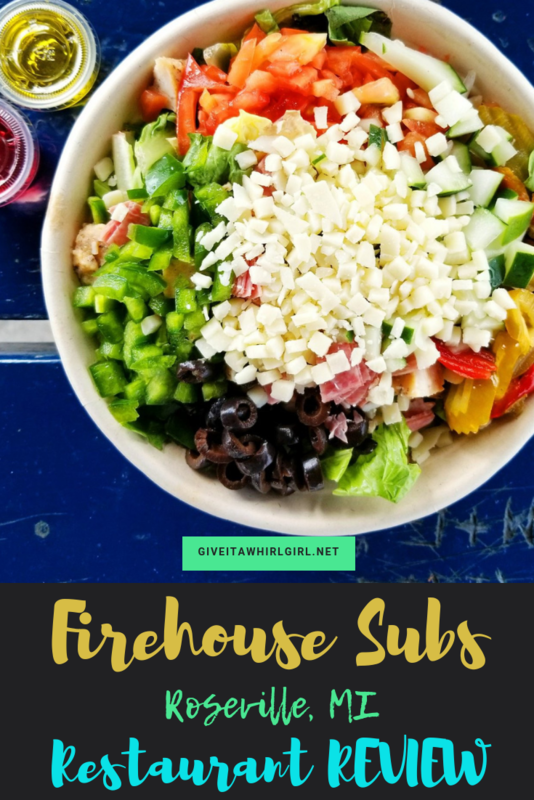 Here is a little bit of a review of my experience with Firehouse Subs. I ordered the Italian With Grilled Chicken Salad and added on some cherry peppers and black olives (free of charge). There were a lot of extra toppings you could choose from that did not cost any additional money, which I thought was wonderful! You can see the photo on their website. I just kept on eating and eating this salad. It was huge and seemed neverending but in the greatest way. I most definitely feel that I got what I paid for with my $8. This salad was chockful of meat and veggies. No sad salad to see here folks! This was one of those rare occasions when your salad actually turns out looking better than the advertised photo! I have been to Firehouse Subs a couple times before (back when I was eating regular bread) and I always ordered the Engineer. That was a hot sub that had mushrooms on it and that sub never disappointed. The food here is always fresh, the establishment was squeaky clean when we came in, and the staff was helpful and friendly. My husband, Joe, ordered the Italian Sub and Chloe ordered the kid’s Meatball Sub. No surprise there because those are both their usual subs. Both my husband and my daughter were super duper happy with what they brought to the park to eat. My daughter’s Meatball Sub was the perfect size for a meatball-loving kid! Her sub had two large meatballs on it and melted provolone, zesty marinara, and Italian seasonings. If you have not yet tried Firehouse Subs use the store locator tool to find one near you. After our picnic, it was time to play at Fort Fraser. This place was so neat. It was a giant wooden play structure with plenty to do. We all had a blast playing around here and it is one of the greatest playgrounds I have visited in my area. This play structure is great for children of all ages. There is something for everyone here. There is even a decent restroom on site just in case you have to go. We were all having a ton of fun and then suddenly the fun just stopped. I will say one negative thing about this park~ they have a major problem with BEES. Chloe had a bee on her and she naturally freaked out and started dancing and prancing around to get the bee off of her. Well, it ended up going inside of her mouth and stinging the inside of her lip! She was screaming bloody murder and I do not blame her one bit. We gathered up all of our stuff and left immediately to find a pharmacy to get some Benadryl for her because her lip was swollen and fat. The pharmacist suggested a full adult dosage since she was having an allergic reaction with the fat lip. She got her medicine and put some ice on her lip when she got home. What a way to end the day right? What a nightmare. Hope you enjoyed my FireHouse subs review today! How did you spend your Labor Day holiday? Leave me a comment and fill me in. Ready to learn more about Firehouse Subs and find out where you can get one? This entry was posted in Local Spots I Visited, Tried It Out Tuesday and tagged Firehouse Subs, Fort Fraser, Fraser, gluten free, glutenfree, Italian, Italian sub, meatball, park, picnic, restaurant, restaurant review, review, Roseville, salad, sub, submarine, Tried It Out Tuesday. Bookmark the permalink.